by some little critter before we dug them up. The critter certainly appreciated our potato growing efforts. Year number two of planting potatoes, and we wound up with a whopping harvest of....wait for it....drumroll...ONE POUND! Watch us as we unveil some potatoes! Yeah, I know. It's an insanely small harvest. We tried a new method this year, using towers made of wire (click here to see how we set it up), and in theory the method should work really well. Some of the things we did wrong were obvious right away, and using this experience, we'll be ready to tackle potato growing anew next spring. The cool thing about our potato growing, like most other things we do in the garden, is that we had so much fun trying. We were slightly more successful than last year, which will only push us to try again. The only way to know if something will work is to try it, and so we are really glad we jumped in and did it! We noticed very soon after planting that the area for potato growing had a pretty serious lack of sunlight. Just as we predicted, the tower on the far right produced the most, since it bathed in sunlight for a good 6-7 hours each day. The middle tower produced about as much as we planted, with about 4-5 hours of sun a day. The left tower produced nothing at all, getting less than 3 hours of precious sunlight each afternoon. This photo makes an obvious illustration of the importance of sunlight. As we dug into the towers with our hands (and then the shovel, because mama ran into a wood spider and was having no more of that), we saw that in the places where there was a nice amount of solid compost, the potatoes grew. The layers of straw mostly just dried out, and grew nothing in them. It's clear in the pictures and in the video that there was a lot of empty space at the top of the towers. I had anticipated the entire tower being filled as the plant grew and we kept covering it. However, as a new potato grower, I think I may have been too conservative, and too afraid of hurting the potato plant, so I didn't pile material on top of the plants as often as I could have. I think that effected the outcome of our harvest, coupled with the fact that we used too much straw and not enough compost/soil. Despite spending hours cleaning up that section of the fence early this spring, there resides a vine plant on the neighbors' side of the fence that simply will not die. We chopped, we dug out roots, we poured boiling water on the bigger trunks of the vine plant that we couldn't remove. If only veggies were this easy to grow. The insanely aggressive plant just kept trying to return. If I left the towers alone for more than three days, the vines would almost take over. Until we can find a better way to control those vines, we'd be better off growing our potatoes in a spot where there is not such an aggressive competitor for the soil's precious nutrients. where there was mostly compost. Will we use towers again? Absolutely. Let me tell you how we will do it differently, though. First of all, we will place our towers in a very sunny location, without the threat of the killer vines. We will probably rethink the use of the straw; definitely use less, or perhaps it would be better to use it as a barrier along the inside of the tower, rather than as a growing medium. Or, we could line the inside of the tower with cardboard to keep the contents inside and just stick with mostly compost as the growing medium. Either way, we will need to make sure the tower doesn't dry out, because that is how we ended up with thick layers of dried-out straw that grew absolutely nothing. The potatoes need some density and a thicker, moister growing medium. I'm not against the idea of also experimenting with a tower built up out of boards, as seen in this link. I can find free pallets pretty easily around my city, and if they are stamped with HT (heat treated), they are safe to use for gardening endeavors like this. We already have these wire towers made, however, and I'd really like to give them another shot. Perhaps if I'm really motivated, I will try growing a couple of each kinds of towers at the same time. Our experiment was not a wild success, but the little success was good enough to keep us going! Come back to the blog soon for an update on all four potato experiments carried out by several of my gardening pals. The original post, which includes my step-by-step building of the towers and a description of the other experiments can be found HERE. What great enthusiasm and documentation. I am eager todig up our crop this season as I did not divide the seed potatoes into smaller pieces and they were hit by frosts. I hope you eenjoy your little bounty. It will only be better next year! Hi Jillicious! I did not divide my seed potatoes up either, but they were fingerlings. I felt like I didn't know what I was doing at all, to be honest. ;) I hope your harvest is bigger than mine...do come back and update us! Thanks for sharing this... 1# is enough for a meal! 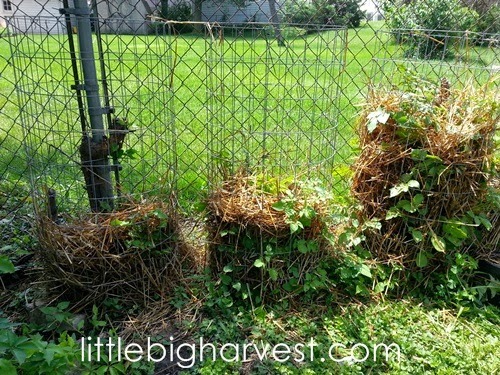 :) I want to try potato towers here, we have been thinking of trying them with tires but I like your wire cages. Maybe next year! Hi Julie! I would really like to try tires as well. I feel like the tires would keep the piled-up growing material nice and moist. Thanks for stopping in! Sounds like you learned lots of great lessons this year from the experiment! And 1 lb. of potatoes is pretty good for a first try experiment :) Loved seeing the outcome. I'm so glad you came by to check up on it, Caitlin! Having this tiny harvest has us pumped up to improve our methods and try again next year.